Divide 1 container yogurt between 2 (8-oz) parfait glasses or dessert dishes. 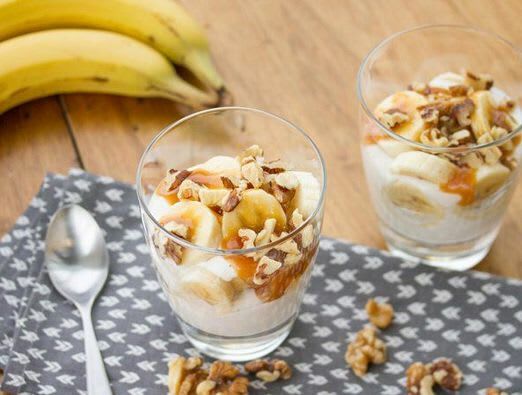 Spoon half of the banana slices over yogurt in each glass. Top with remaining yogurt and banana slices. Spoon caramel topping over yogurt. Sprinkle with walnuts. Serve immediately. No parfait glasses? Wine glasses or slim drinking glasses work just as well. Soften caramel topping in the microwave for just a few seconds to easily drizzle over the parfait.